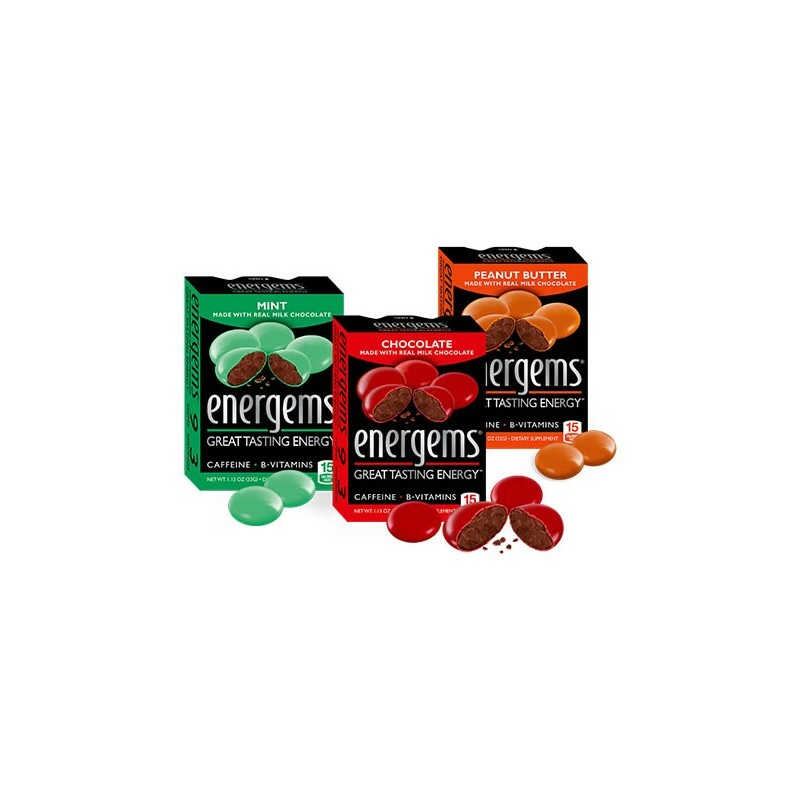 Energems are great tasting energy. They are bite-sized, hard-coated gems made with delicious milk chocolate. They contain caffeine, B vitamins and a unique energy blend. The box is easy to carry around so you'll never be without a delicious source of instant energy! "A Better Way to Energy"
Available in three yummy flavors: Chocolate, Mint, and Peanut Butter. 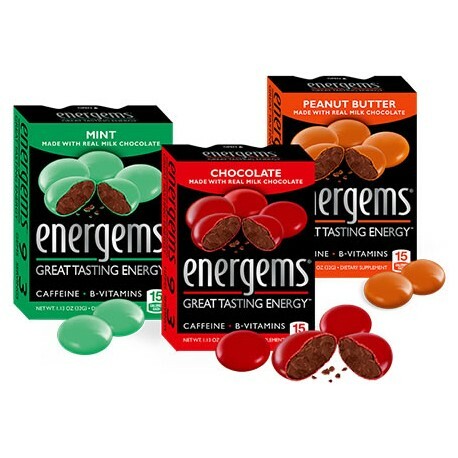 Each box contains 9 Energems and 3 Energems = 1 cup of coffee. Milk Chocolate (Sugar, Cocoa Butter, Chocolate Liquor, Whole Milk Powder, Lactose, Soy Lecithin, Salt,Vanillin (An Artificial Flavor), Sugar, Energy Blend, Gum Arabic, Artificial Coloring (Includes Red 40 Lake), Confectioner’s Glaze. Contains Milk, Soy. May also contain Peanuts, Tree Nuts, Wheat. Milk Chocolate (Sugar, Cocoa Butter, Chocolate Liquor, Whole Milk Powder, Lactose, Soy Lecithin, Salt,Vanillin (An Artificial Flavor), Sugar, Energy Blend, Gum Arabic, Artificial Coloring (Includes Yellow 5 Lake, Blue 1 Lake), Natural Mint Flavor, Confectioner’s Glaze. Contains Milk, Soy. May also contain Peanuts, Tree Nuts, Wheat. Milk Chocolate (Sugar, Cocoa Butter, Chocolate Liquor, Whole Milk Powder, Lactose, Soy Lecithin, Salt,Vanillin (An Artificial Flavor), Sugar, Energy Blend, Peanut Butter Flavored Coating (Sugar, Partially Defatted Peanut Flour, Partially Hydrogenated Palm Kernel Oil, Nonfat Dry Milk, Dextrose, Soy Lecithin, Slat), Gum Arabic, Artificial Coloring (Includes Yellow 6 Lake, Yellow 5 Lake, Blue 2 Lake), Natural and Artificial Peanut Butter Flavor (Refined Peanut Oil, Peanut Extract, Sesame Oil, Vitamin E, Flavors), Salt, Confectioner’s Glaze. Contains Milk, Peanut, Sesame, Soy. May also contain Tree Nuts, Wheat.